An industry standard in DJ equipment with a more compact design and improved software. In this photo from Red Bull, Diplo can be seen using the Rane SL3 hooked up to some CDJs at the Red Bull Guest House. 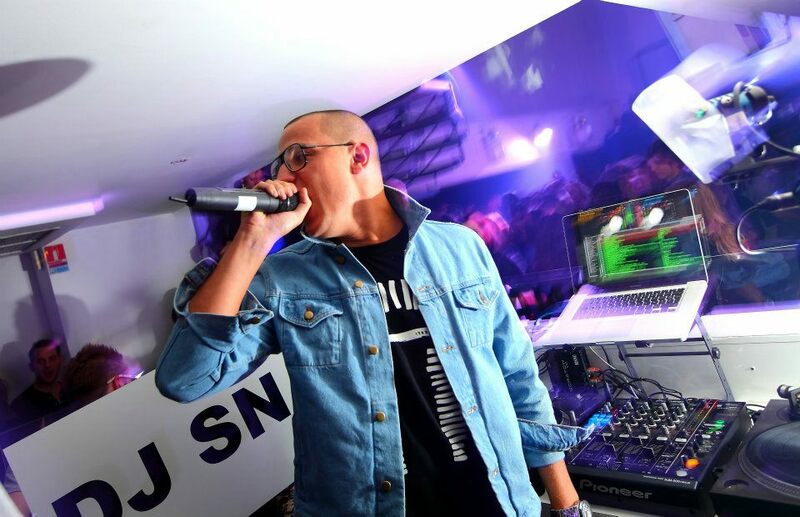 From Aoki's technical rider: "1 Serato SL3 Scratch Live by Rane ** SL1 WILL NOT WORK **"
DJ Snake can be seen using a SL3 just to the right of his left arm, beneath the laptop, in this photo. The Rane SL3 USB interface can be seen to the right of Popeska's DJM mixer, in this photo taken during one of his DJ sets. When Aiden Jude first started, he used to play on Serato Scratch Live. He then moved to Rekordbox. The Rane Serato Scratch SL3 USB interface connects 1 or 2 standard vinyl or CD turntables to your computer and the mixer of your choice. With regular turntables or CD players and the included Serato Scratch Live software DJs can use the Rane SL3 to scratch and mix files from their Mac or Windows computers' CD or hard drive. Enhanced by studio grade preamps and 24-bit audio processing, the compact SL3 interface produces a warm punchy sound to heighten the senses. The auxiliary outputs allow DJs and electronic musicians to intensify the mix with the Scratch Live SP-6 Sample Player. The auxiliary inputs provide a live input feed for creative sampling or recording your set. Use any combination of audio sources: control CD, control vinyl, MIDI, or regular CDs and vinyl for more flexibility than ever. SL3 comes with 12" vinyl LP records and control CDs that each have Serato's exclusive and unique control signal which allows SL3 to track the motion of the record, simulating the same movement with digital audio. Due to Serato's proprietary control scheme, the result is a feel and sound indistinguishable from playing vinyl. The included Scratch Live 3 software supports all these file formats: Fixed and Variable Bit Rate MP3, AIFF, AAC, WAV, OGG Vorbis, CD Audio, and direct from the mixer. Record from your mixer's Aux output and immediately scratch as if it was on vinyl. Record direct from vinyl or CD and save as a 24-bit/48kHz stereo file. With the help of the SL3 interface, Serato Scratch Live can easily import your playlists and iTunes library. DJs can drag from Explorer (Windows) or the Finder (Mac) into the Scratch Live library. The crate and subcrate system helps organize libraries and sets. Hot-swap external drives with fast automatic library merging and retention of crates. Browse your music collection by album, artist, BPM, or genre, with optional album art display. Intuitive search function can be applied to any field to find things quickly. Edit ID3 tags with full Unicode support. Serato Scratch Live's Virtual Deck shows everything about the speed and position of a track. As the vinyl rotates, so does the line on the label. The circular progress bar around the edge is a visual representation of the position within the song. The time and remaining time are displayed in minutes and seconds. The turntable speed as a percentage of pitch shift is on the left, and the pitched BPM is on the right. Absolute Mode-exact reproduction of record movement, needle drop through tracks-just like normal vinyl. The beginning of the track is mapped to the start of the record. Relative Mode-skip-free scratching, jump to cue points, and pitch bend buttons combined with turntable control. This mode observes the relative forward and backward movement of the record, but does not regard the position within the record. Internal Mode-mix with just your laptop using features modeled on DJ CD players. Rewind, Bend down, Play/pause reverse, Play/ pause forward, Bend up, Fast forward. Auto mode-play a sequence of tracks automatically. With Key Lock on, the key or pitch of the song stays locked at what it would be if the track was playing at normal speed, regardless of the platter speed of the turntable or CD player. Key Lock has scratch detection, so SL3 automatically turns off when scratching for a natural scratching sound. Variable zoom waveforms centered around current position display horizontally or vertically. Waveforms are colored by frequency so you can distinguish instruments visually. Full-track overview lets you quickly find where the beat drops, find breakdowns and choruses, and jump to any part of the song. The tempo display assists with rapid tempo matching of tracks. When the two tracks are matched to the same tempo, the peaks will line up. Beat display emphasizes the transients in tracks-these are matched up when the two tracks are beat matched. Visual markers can be set for up to 5 cue points per song and triggered from the keyboard. Save up to 9 loops per track-these loops are saved in the file, and will be present when you reload. Censor expletives on the fly with an instant quick-reverse and catch-up with no loss of timing or pitch. MIDI control can interface USB controllers with Scratch Live. DJ controller support will vary. Built-in help and tips in multiple languages are accessible anytime. There is even a low-power warning when running off a laptop battery. Upgraded for Serato DJ & three decks. Got this in December 2014, looking to use it for three deck mixing. I have an SL1 and want to upgrade to using Serato DJ for DJ sets. Having used a Rane SL1 for a very long time, I upgraded to an SL3 purely as a future proofing exercise. At the first performance however, I was blown away with the difference in the quality of the sound from this little box! As with all Rane hardware, it is built like a tank and happily takes everything a life on the road can throw at it! When I started Djing I used DVS. I could not afford Serato DVS so I torrented it and put all the music on this Audio Interface somehow it worked? I still use it with my CDJs but I mainly DJ from a laptop now.